October is National Breast Cancer Awareness Month. It’s the time of year we’re virtually pinkwashed with the staggering reality of breast cancer’s big numbers. Like a U.S. woman’s average risk of developing breast cancer sometime in her life is 12%. That’s 266,000+ new patients diagnosed per year (Source: American Cancer Society). But in the age of social media, can these big numbers become a big advantage in improving awareness? In a word: Yes. 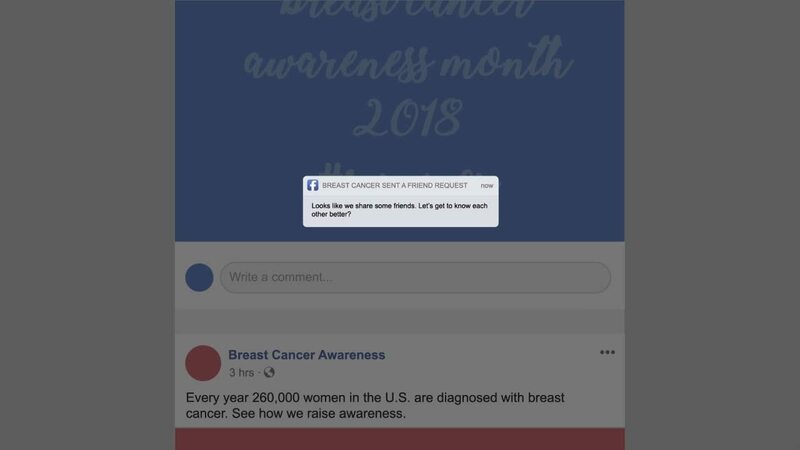 This month, we started our own social media experiment by creating a Facebook post that shows what it would be like if breast cancer could easily find you and Friend you online. What do you think? Creepy enough? By creating a catchy concept, the #KnowYourLemons Worldwide Breast Cancer campaign gave women the critical information needed to spot lesser-known warning signs and share their personal tales with a growing online community. The charity set up a standalone members’ page on Facebook where people could read regular news updates, donate to the cause, and take part in active conversations about the subject. Using a lighthearted campaign concept to convey a serious subject and giving people a platform on which to share their thoughts and stories resonated with the audience, and it led to Worldwide Breast Cancer exceeding their fundraising target by 317% on Just Giving alone.Take a closer look. As a society, when we think about breasts, thoughts of vanity usually come to mind first. We talk about how they look—either too small, or too big. This simple, yet impactful campaign challenges conventional notions by engaging young women in conversations around their health, encouraging them to be proactive about their breast health. See more about this campaign and other inspired breast cancer awareness campaigns. What inspires you during Breast Cancer Awareness Month? Let’s make October the time to make a difference by sharing our breast cancer awareness stories and messages on social media, one post at a time. And encourage your friends and family to talk to their healthcare providers about breast cancer screening.